GOLD MINING bosses are finding mergers and acquisitons "easier" than exploring for new deposits underground say analysts, as the sector sees its second mega-deal inside four months. Following the merger at end-2018 of former No.1 gold miner Barrick with No.15 Randgold, today's No.2 producer Newmont is now moving to buy the No.4 Goldcorp and so reclaim its title as "the world's leading gold company", boasting of what will be the "strongest portfolio of world-class operating gold mines and projects in favorable jurisdictions [primarily the US and Canada] with [the] largest reserve base and unmatched exploration potential." Echoing last September's Barrick-Randgold announcement, "This combination will create the world's leading gold business," says Gary Goldberg, CEO of Newmont (NYSE: NEM). 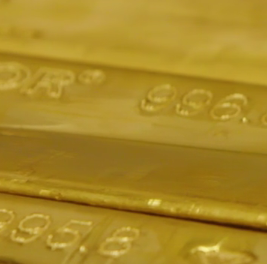 "This combination creates the world's premier gold company," agrees David Garofalo, CEO of Goldcorp (NYSE: GG). "Mr.Garofalo has been massively overpaid," replied the Shareholders' Gold Council, a group of 17 hedge funds and other investors formed in 2018 to agitate for better management of gold-mining companies in the hope of making stronger returns. "Stockholders [in Goldcorp] have lost over C$3.7bn since his appointment [US$4.8bn] and Goldcorp now wants to sell itself at only a slight premium to its 1, 3, 5, 7 and 10-year low in share price." Talking about "discipline" in production costs, this week's NEM-GG announcement promises an "industry-leading dividend – stable and sustainable [at] $0.56 per share." Newmont paid $0.70 in calendar 2018, the most in cash terms since 2013 and also the highest dividend yield in 5 years as a percentage of its stock price. 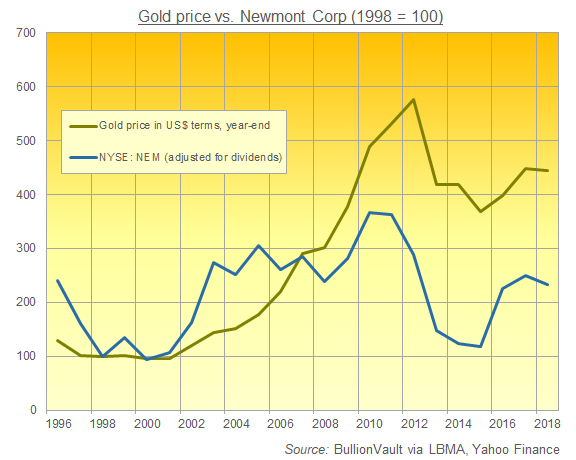 Over the last three decades Newmont has yielded an average 1.1% to stockholders. The near-halving of US Dollar gold prices from 2011 to 2015 saw miners slash both M&A and exploration budgets as share prices cratered. 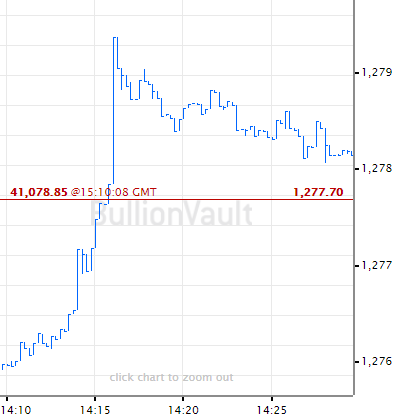 Now with gold recovering by 25%, "Companies are struggling to compete for lower costs whilst trying to replenish their reserve base," says Adrian Hammond, gold-mining analyst at South African brokerage SBG Securities. 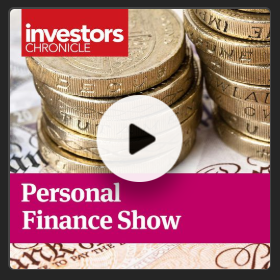 "So acquiring assets has [again] become the easier alternative" to trying to find new untapped reserves below ground. 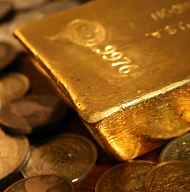 Rising by 18.6% in 2018, and accounting for half of all non-ferrous metals exploration spending, gold exploration budgets matched the minerals sector's wider growth to the highest level since 2014 according to data compiled by S&P Global Market Intelligence. But the industry continues to suffer "diminishing returns on exploration and the lack of 'world-class' discoveries" says Mark Fellows, head of mine supply at specialist consultancy Metals Focus – a trend starting when new finds peaked in the 1980s. "The future pipeline is almost devoid of projects capable of producing over 250,000 ounces per annum," Fellows writes in a recent report from the mining industry's World Gold Council, "[whereas] mines producing over this threshold are responsible for around 50% of global production today." 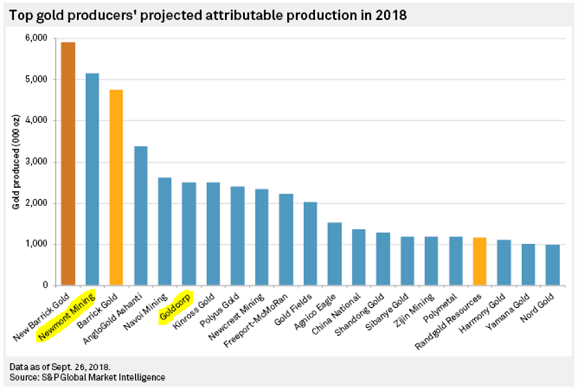 "There is frequently a 10-year gap from when gold is first discovered in a given area to commercial production," adds Michelle Ash, chief innovation officer at Barrick, also writing in Gold 2048. Shares in Newmont have meantime fallen 10% on the New York Stock Exchange since Monday's news, dropping within $1 of last autumn's 2.5-year lows at $30 per share. Goldcorp meantime trades near its weakest stock price since start-2016's 13-year lows. Newmont's offer comes at a 17% premium to GG's recent levels, to be paid in NEM stock and suggesting a combined value of more than $26 billion. Barrick Corp. – now trading since New Year under Randgold's previous NYSE ticker symbol of 'GOLD' – shows a market cap of $21.5bn. Founding member of the Shareholders' Gold Council, John Paulson's eponymous hedge fund group saw assets under management fall by more than three-quarters between their 2011 peak – back when the gold price peaked above $1900 amid the US debt downgrade, Eurozone debt criris and English riots – and the start of 2018. "Most of what's left belongs to Paulson himself," said Bloomberg last spring, after clients pulled money in response to the funds' poor returns.